From left, the Duke of Edinburgh, China's first lady, Peng Liyuan, Queen Elizabeth II and the Chinese President Xi Jinping at the Grand Entrance to Buckingham Palace, London. Chinese president addresses parliament during visit British government is touting as opportunity for two countries to boost trade and investment. Chinese President Xi Jinping addressed Britain's parliament Tuesday during a visit the British government is touting as an opportunity for the two countries to boost trade and investment, while human rights advocates urge questions about China's human rights record. Earlier in the day, Xi was greeted by Queen Elizabeth Tuesday at Buckingham Palace during a lavish welcoming ceremony. His four day trip also includes talks Wednesday with Prime Minister David Cameron, dinner at Cameron's country retreat and visits to businesses. The prime minister's office said this week some $46 billion worth of deals will be completed, and that Britain and China will also discuss cooperation related to the threat of terrorism and extremism. 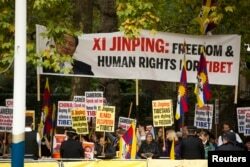 Human rights demonstrators hold up a protest banner bearing an image of Chinese President Xi Jinping before he passed by on a horse-drawn carriage with Britain's Queen Elizabeth II on the Mall en route to Buckingham Palace in London, Oct. 20, 2015. Human rights advocates are planning protests throughout Xi's visit and calling for Cameron to address China's human rights record with the Chinese leader. A spokeswoman for Cameron said Monday that "nothing is off the table." The group Freedom Now, which represents detained Chinese Nobel laureate Liu Xiaobo and his wife Liu Xia, released a letter Tuesday written by 12 fellow Nobel Peace Prize winners urging Cameron to call on China to set the pair free. The laureates, including Desmond Tutu and the Dalai Lama, also ask that Cameron push for Liu Xia to be allowed to travel abroad for medical treatment.